Helen and Mike had an Arrow Church wedding in Alcester. As you can see from this image, the trees had just started to turn a superb golden yellow colour with the onset of the autumnal weather. The couple had booked Deer Park Hall in Worcestershire for their wedding venue, but because of the lovely autumn colours that were at the church, we decided to take a few photos here before moving off. Unfortunately it had gone quite overcast and the light was rather poor and unflattering, so I decided to use an off camera flash and a large soft box for this 'strobist' wedding photo. This image was taken a couple of years ago and the way the bride and groom are standing here has become my signature pose. 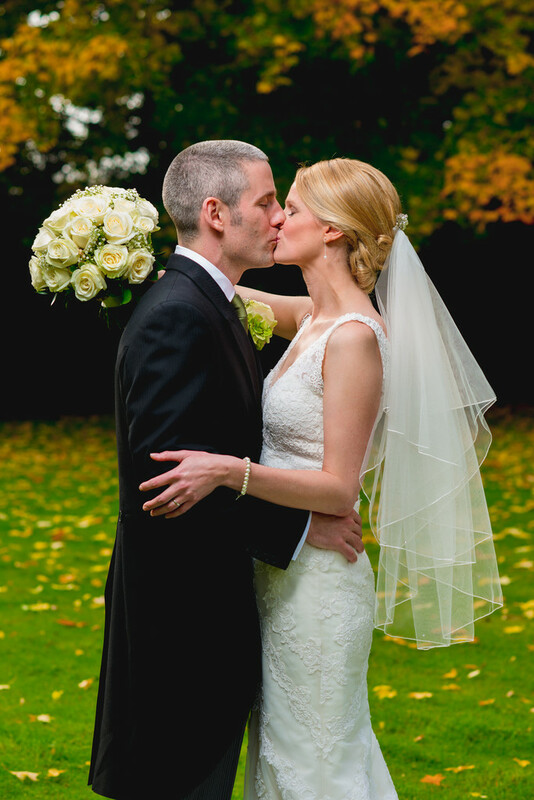 Standing the bride and groom like this enables you to see everything that's important - the wedding dress, the veil, the bride's wedding and engagement rings, the groom's buttonhole flower and the wedding flowers too. To create the image, I had my assistant hold the flash to the left of my camera on a boom pole and triggered it remotely. I used manual exposure mode in order to workout how I wanted the background to look, and used the flash o ETTL mode with a Pocket Wizard Mini TT1 on the camera and a Pocket Wizard Flex TT5 on the flash. 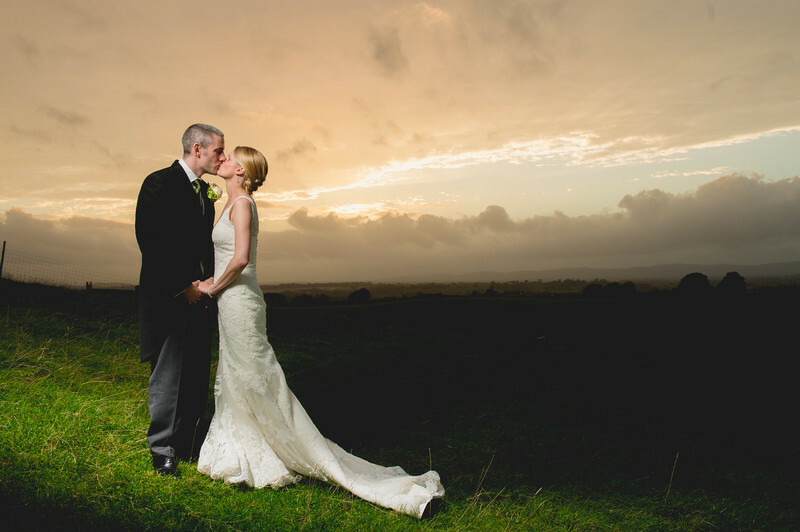 I used exactly the same technique for taking this photo of the couple at sunset, on the hill beside Deer Park Hall, looking towards the Malvern Hills in the background.